During April–May 2004 an excavation was conducted in the Lower Aqueduct to Caesarea (Permit No. A-4156*; map ref. NIG 19175–7/7160–5; OIG 14175–7/2160–5). 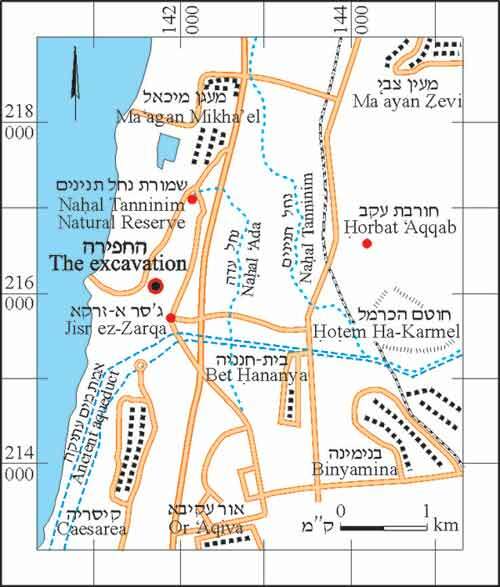 The excavation, on behalf of the Antiquities Authority, was directed by H. Torge, with the assistance of S. Ya‘aqov-Jam (administration), V. Essman and V. Pirsky (surveying), T. Sagiv (photography), M. Shuiskaya-Arnov (find drawing), J. Porath and P. Gandelman. 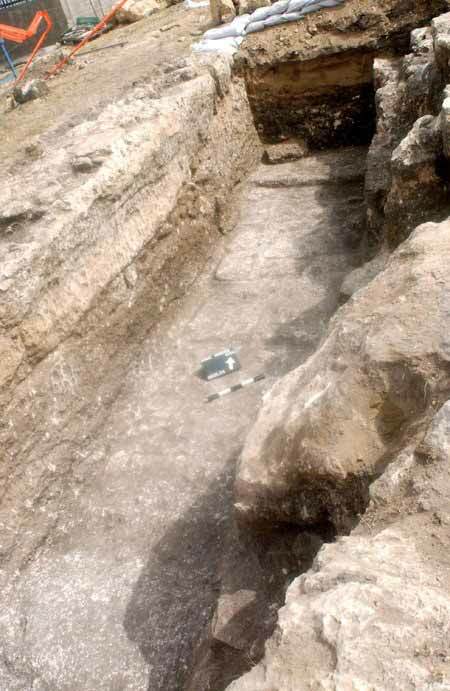 A section (length c. 10 m) of the aqueduct that is hewn in the kurkar bedrock and aligned north–south, was excavated on the outskirts of Jisr ez-Zarqa (Fig. 1). Traces of construction were discerned above the hewn walls of the aqueduct. They consisted of dressed stones and fieldstones bonded with pale gray mortar (preserved height in the north 1.8 m, in the south 1.38 m, width of aqueduct 1.8 m; Fig. 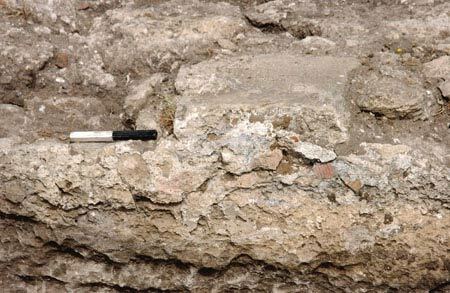 2) and coated with hydraulic plaster and large potsherds, to which a layer of pale white and pink plaster that contained fragments of shells, small stones and ground potsherds was applied. Signs of stone quarrying (average size 0.4 × 0.6 m) were apparent on the bottom of the aqueduct, which sloped to the south and was irregular due to the removal of masonry stones from its bottom at the time it was hewn (Fig. 3). Some of these stones were probably used for building its higher-up walls. The rock-cutting inside the aqueduct was done along a fissure in bedrock. The upper part of the hewn aqueduct was stable and strong, whereas the bottom part was friable and therefore reinforced with construction of stones fastened with mortar. The accumulation of travertine in the aqueduct showed that the level of water reached several centimeters below the top of the hewn part (c. 1.6 m). A large quantity of fresh-water mollusks (Melanopsis), which live in water with a maximum salinity of 15%, indicated the flow of fresh water, although it could not attest to a drinking water quality and probably, the water was used for industry. The size of some mollusks (c. 2–3 cm) showed an extended and prolonged flow of water in the aqueduct (Fig. 4). The fill inside the aqueduct was composed of dark soil strata with layers of clay and beach sand that contained a large quantity of Melanopsis (height c. 1 m), indicating the fill had been deposited when the aqueduct was in use. Hence, this aqueduct section was probably uncovered and the alluvium accumulated at its bottom over time. Many dressed stones from the aqueduct walls were found beneath the alluvium at the bottom of the aqueduct, indicating that parts of the walls had collapsed during its use and were not repaired. 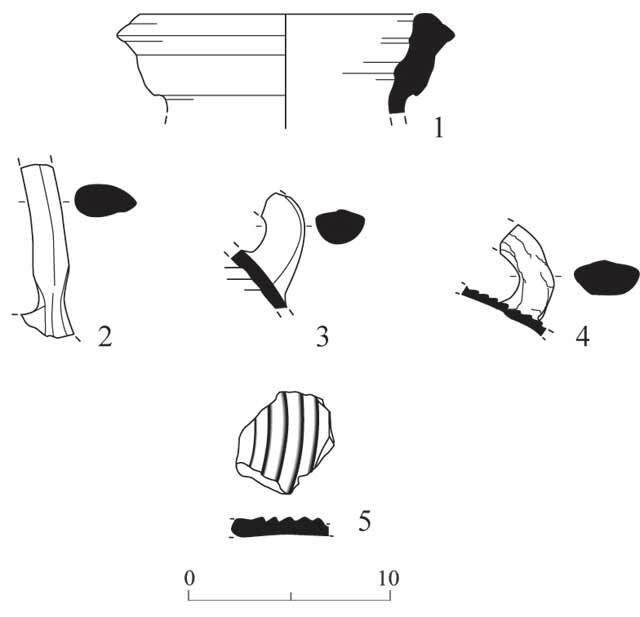 Most of the potsherds from the aqueduct walls were jar fragments that dated to the Byzantine period (Fig. 5:1–5). 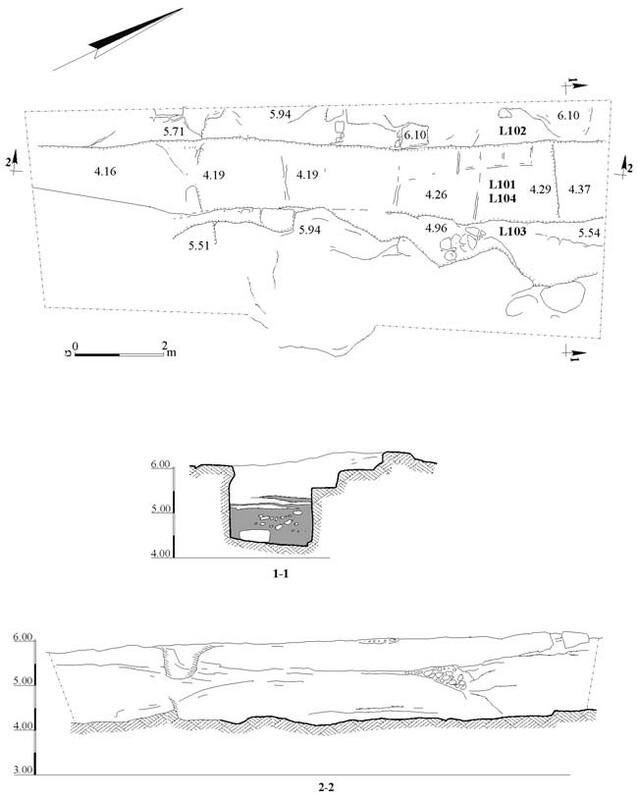 The excavation of the Nahal Tanninim dam (in preparation; J. Porath, pers. comm.) showed that the Lower Aqueduct was probably hewn during the fourth century CE. 3. The aqueduct, looking north. 4. Melanopsis at the bottom of the aqueduct, looking east.